Lots of exciting things are happening in our home these days. The biggest being, we are starting to decorate and renovate. Phase 1 of our kitchen remodel has officially begun, we went to Ikea yesterday and bought cabinets which Mike is putting together as I write this. The next big design decision that has to be made is which couch to buy. 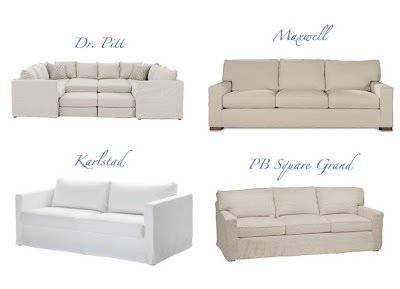 Here are the contenders...Dr. Pitt is my favorite, simply for all the possibilities later on down the line, I mean you can literally build the biggest sectional known to man which will be nice as our family grows. Buuuuut, I also really like the linen option that Pottery Barn offers (all these couches are slip covered by the way, a must for us dog owners!) Then I really like Ikea for the affordability and then there is the Restoration Hardware option which has extra long cushions and is sooo comfy. Ugg, I think I might have to flip a coin on this one, I really cannot decide - stay tuned! Which one do you like best? Ahh, thank you for the advice! My husband is 6 '2 and I'm 5'9 so we definitely need something made for tall people! Very good to know!